Refreshing drink, Love the colour offered by strawberry! I could just so with a lovely ice cold glass of this at the moment. We haven't had any storms but they are surely on their way as it is very muggy today. Looks so delicious and inviting. Greetings from FBC5.Perfect summer chiller. What a perfect recipe for the summer! Wow! 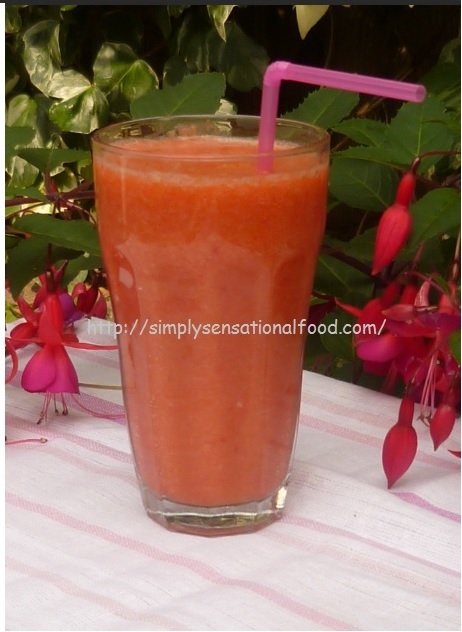 The smoothie looks so refreshing and delicious! Love the pictures! You have a lovely blog! Glad to follow you! Do visit my space at-http://www.rita-bose-cooking.com/. These are great while strawberries are in season. This sounds lovely. i have a hand-held blender which doesn't work great on larger fruit but should manage this I think! I will try this one. I make a lot of Strawberry Smoothies in the summer!! I love a strawberry smoothie. Nice and simple but delicious. I love it. This sounds so refreshing. I want one now! I followed your recipe this weekend and enjoyed one in the garden! Followed this recipe for my boyfriend when he bought home strawberries and said he wanted a smoothie! He loved it (And I had a few gulps and enjoyed it too!) - the icing sugar is a genius touch! This fresh drink is so special! I always cook in summer when the days are very hot! Fresh smoothies are the perfect solution for getting all the necessary vitamins and minerals with the help of a delicious dish. 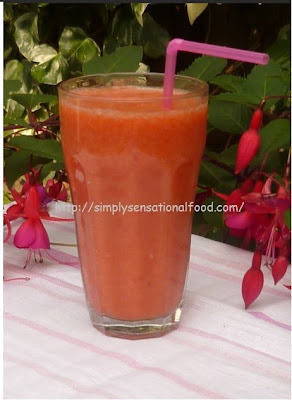 I really like using strawberries to make smoothies, because then I get a very sweet and incredibly aromatic drink. I can say that the content of the post is cool. That is why I bookmarked the site and wait for the fresh entries. I think that the sweet taste of this smoothie will make it very popular with my son's friends who will come to visit him.